New Peace & Power Web Site and Blog! I am delighted to unveil the new Peace & Power web site and blog! 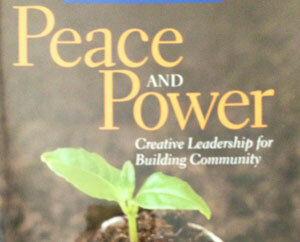 Many folks who read this blog already know about the book Peace and Power that I have authored since 1984. Now, the web site adds two important dimensions to what the book offers. First, now many of the conversations that happen face-to-face or on email can begin to happen worldwide! I have received many emails over the years – emails that I file in a folder named “amazing emails!” These are often messages sharing stories of ways that someone has used the process, or found the process helpful. Often they contain questions that address some of the most persistent challenges in groups, and the challenges of shifting to the ways of “peace and power.” Now these stories and questions can be entered into the comments on the web site. And I will use these comments and questions as “prompts” for blog posts on the site. I hope you will consider following the blog, and participating in the discussions! Second, the site provides a digital “handbook” of the essential elements of the group process – easily accessible on any mobile device that has access to the internet. The process of “peace and power” seems totally simple and easy … and yet I know from my own personal experience how hard it is … as in my last post – “peace” is not an easy thing to do! When I first learned this process, one of the things that we did over and over was to review why we were attempting to do things the way we did them — why we used rotating chair, or critical reflection, for example. And, we constantly reviewed the “how” of doing what we did so that our actions matched our words. Charlene Eldridge and I first wrote the book so that we could share some of these insights with others who were not familiar with the process, and had not experienced it. The book has valuable detail and information about the process and lots of great examples, but the web site provides a nutshell version of the ways of peace and power, along with reminders of the values that are the foundation of the process. I invite you to visit the new site, and participate in the online conversation! This entry was posted in Books, Making change, Peace & Power and tagged peace, Peace and Power. Bookmark the permalink. 2 Responses to New Peace & Power Web Site and Blog! that’s pretty cool and interesting. ones power gives another one peace, maybe in the peace of having little responsibility and yet ones power quickly effects the events and decisions of others. im an underground writer with a loyal following which has forced me to write a fantasy book named LondenBerg by Lord Biron, check it out sometime. thanks. Thanks for your comments — I am reminded that we can actually practice the process on the blog! So I will post some of my reflections on the “peace & power” blog — if you want to participate in that discussion, please go to that blog — you will need to identify yourself in order to participate but your are welcome to read what is posted there if you wish … I will explain more in a post there later today! Thanks again!